The Bombay Store launched ‘Happy Sundays’ – ‘An experiential shopping concept that promises hands-on product experiences, and interesting activities’ last weekend on Sunday, 28th September. Held at the sprawling 10,000 sq ft flagship store at Sir P.M Road, Fort, Mumbai, it offered a graceful dose of retail therapy tailored for customers looking for a wholesome shopping experience. And basis the tremendous response received last Sunday, we have decided to extend Happy Sundays over the weekend from 3rd to 5th October to triple the celebrations & fun. This is what we have in-store for your this weekend. Celebrate Diwali this Dussehra with a flat 25% off at all our stores for the auspicious occasion of Dussehra. We also have a Flat 25% online on some newly arrived Handicrafts & Home Décor items. Could we make your weekend any awesomer? 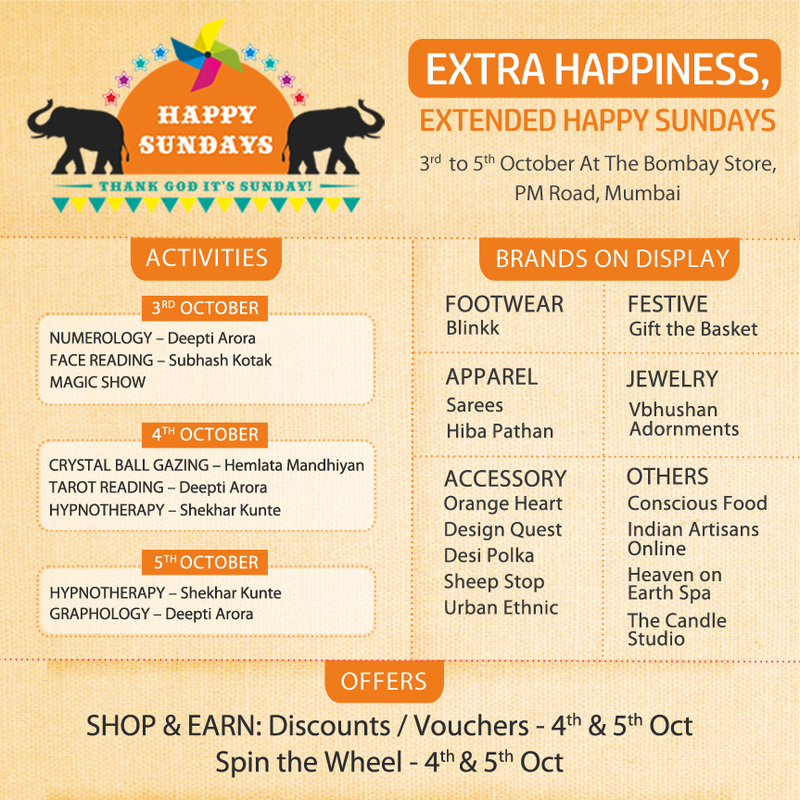 Do visit The Bombay Store anytime from 3rd to 5th October & be a part of our Extra Happiness with these Extended Happy Sundays! See you there!